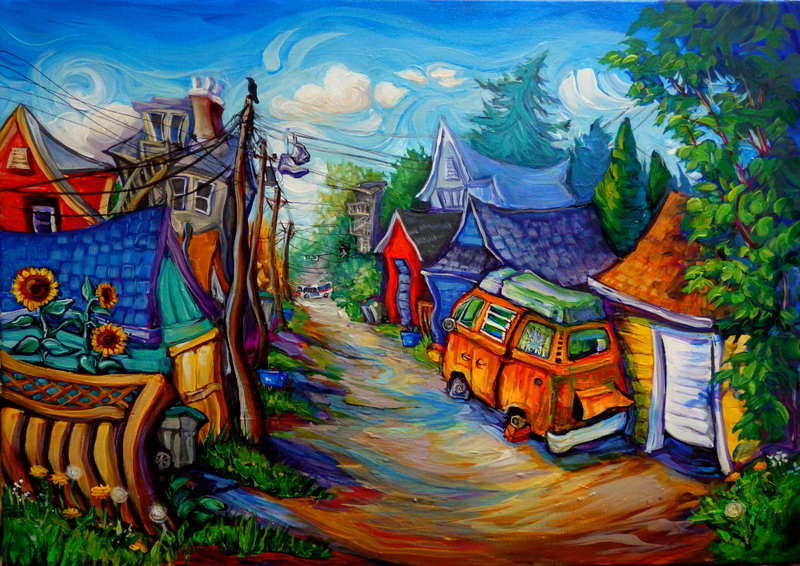 Theatrical backdrop design for “Cinderella: An East Van Panto”. The design was enlarged to 17 feet high by 24 feet wide. The inspiration for Cinderella’s alley comes from the alley between 13th and 14th Avenues just east of Fraser Street. The idea was to create a Crayola-happy sense of backyards and gardens rather than urban grit and graffiti because this is a place where families live, after all. 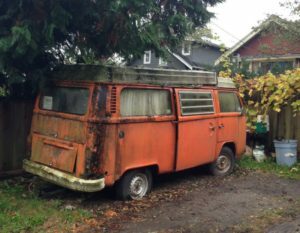 The characteristic East Van touches are the running shoes thrown over the telephone wires, a pole-sitting black crow, and cheerful jumbled up garages next to overgrown organic gardens. The #8 Fraser Street bus is passing by at the end. I live in this neighborhood and there are a lot of old VW vans around. Cinderella’s helpful vermin friends probably live in the one seen here. 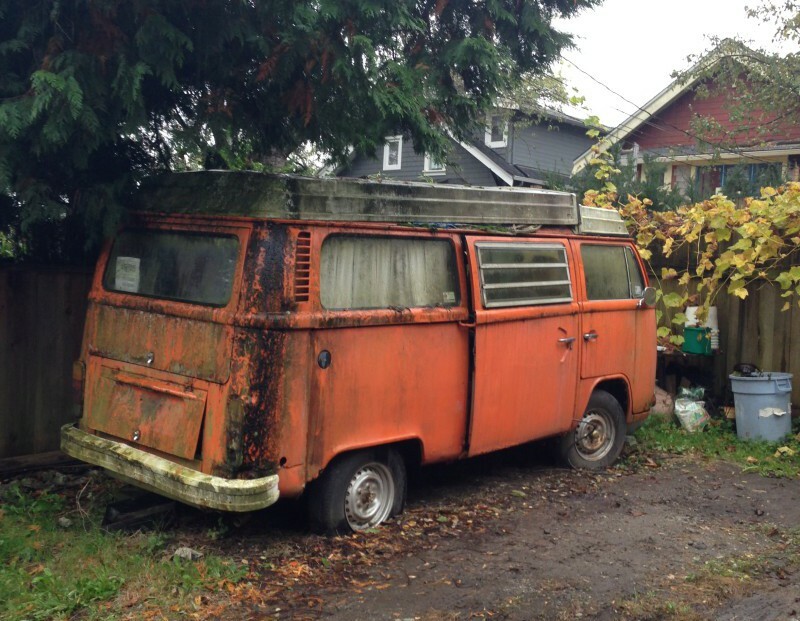 The orange VW van really exists, too, though in real life it is a block east. Vancouver alleys, whether they are urban gritty or backyard overgrown, are always messily beautiful in their roughshod untidiness. 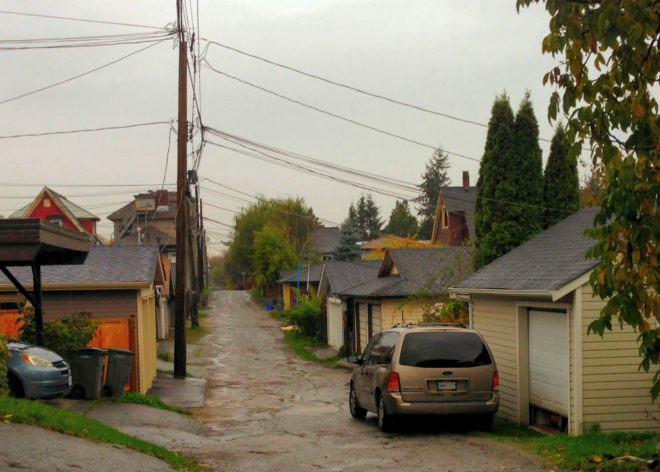 Our city has just as many fascinating back alleys as it does front facing streets and avenues. Probably more.